In the course of reggae history many great singers managed to release only a handful of singles or so. One of those is former Soul Defenders lead vocalist Vin Morgan, who also played keys and drums with the band. However, Soul Defenders is probably not known for their own material, but for being one of the backing bands at Studio One. And they played on several immortal cuts, including Freddie McKay’s Picture On the Wall and The Abyssinians’ Declaration of Rights. Vin Morgan resurfaced in 2014 when he cut the single Resilience with bass man Boris Gardiner. And now about 50 years after he started his music career his debut album has landed. It’s not a collaboration with Boris Gardiner though, but with producer and engineer extraordinaire Roberto Sánchez and his Lone Ark Riddim Force. Give Thanks is another showcase album from the Sánchez and Iroko Records camp. Six vocal cuts are followed by their dub counterpart. Most riddims are known from before if you have the two previous showcase sets – Noel Ellis’ Zion and The Viceroys’ Memories – and they suit Vin Morgan’s falsetto singing perfectly. His voice sounds remarkably fresh. Expressive and emotive. Just as the dub versions and the horn arrangements. Check the militancy of a cut like Can’t Complain Dub with its smattering percussion, haunting keys and fanfare like horns. Best of the bunch is however the bright and uplifting Gimme the Vibes. It’s a mystery why Vin Morgan didn’t cut more tunes in the 70s, but luckily Roberto Sánchez and Iroko Records’ Herve Brizec gave him a fresh chance. Africa has a fast rising reggae star. His name is Bi.Ba and he’s from Madagascar. He’s actually been around for quite some time and on his brand new album Massavana he has collaborated with Spanish musician, producer and mixing maestro Roberto Sánchez and his Lone Ark Riddim Force. When Roberto Sánchez is involved satisfaction is usually guaranteed. And this is the case with Bi.Ba’s second album. Bi.Ba has a touching and soothing tone in his voice and the production is heavily influenced by 70s Jamaican roots. Roberto Sánchez has given the set a feel of authenticity with vintage vibes and live instrumentation complete with beautiful harmonies – listen to Mr. Babylon – and dub versions to four of the cuts. A stunning album from an artist that will put Madagascar on the reggae road map. French label and sound system Blackboard Jungle has once again put out a killer release with help from France’s Rockers Disciples and Spain’s Roberto Sánchez along with a few other key musicians. Sounds From the Ark is a stellar 12 track album where wonderful instrumentals rub shoulders with killer vocal cuts and lethal dub versions. The set is inspired by nature and the classical elements, and with that backdrop a team of musicians, including Rockers Disciples, The Producers, Don Fe and Prince Jamo, created a number of instrumental pieces that later formed into Sounds From the Ark. The inspiration for this album is clearly showcased by the song titles – Water of Life, Fire Rises and Mystic Wind – and the set is organic taking the listener on a journey from the depths of the oceans to the mountain tops. A beautiful album. Just as nature. About five years ago I had the opportunity to interview Spanish producer, mixing engineer and musician Roberto Sánchez. In the interview he mentioned a few dream projects and one of those was working with Jamaica harmony trio The Viceroys. That’s no longer a dream and the project has materialized. Memories is a the second showcase album on Iroko Records produced by Roberto Sánchez along with Iroko’s own Herve Brizec, and it follows Noel Ellis’ Zion. This brand new album includes six beautiful vocal cuts directly followed by their ground shaking dub counterpart. Just listen to All I Dub. When the bass line drops it’s like you want to shed a tear. And just like all other productions coming from Roberto Sánchez and his Lone Ark Riddim Force this sounds vintage to the bone. This could have been a forgotten gem recorded by The Viceroys at Channel One back in the late 70s. This is heavy roots. This is roots full of culture and consciousness. Just like way back when. Noel Ellis, son of the late and great Jamaican singer Alton Ellis, dropped his self-titled debut album in 1983. It was recorded in Canada and overlooked at the time of release. Fortunately it was picked up Light in the Attic Records and reissued almost ten years ago. 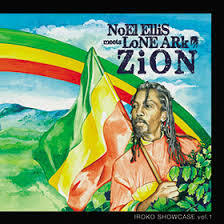 Now – more than 30 years after the release of his debut – Noel Ellis has finally put out his second album Zion. It’s a twelve track showcase set – six vocal cuts and six dub versions – released by French label Iroko. It’s facilitated by acclaimed producers Hervé Brizec and Roberto Sánchez and has a distinct vintage feel to it. Zion is a coherent and classic set with pleasant and heavy dub versions where Roberto Sánchez has put the smattering percussion in front of the mix, as shown on the deep Jah Dub, the version to the excellent and devout Jah Love. Noel Ellis has a versatile voice with a melancholic tone and album opener Zion presents a mode where his graceful singing sounds a bit nervous, while he on the cavernous and slow Reggae Music shows a more powerful style. On I Know he actually sounds a little like the great Ken Boothe, grittiness excluded. 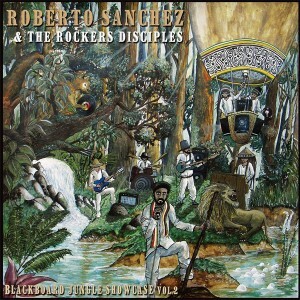 Roberto Sánchez has previously recorded a number of vintage reggae singers to wide critical acclaim. And Noel Ellis’ second album can definitely be filed next to soon-to-be-classics like Milton Henry’s Branches and Leaves and Earl Sixteen’s Natty Farming. The second showcase album from French label and sound system Blackboard Jungle features renowned Spanish producer, mixing engineer, singer and multi-instrumentalist Roberto Sánchez and French roots rockers The Rockers Disciples. It follows the first showcase album on which The Rockers Disciples teamed up with UK vocal duo Reality Souljahs. And just as the first volume, Blackboard Jungle Showcase Vol. II comes with 12 tracks and each has a hard and driving dub version. It’s a stellar set. Even better than the first volume. Roberto Sánchez is a gifted vocalist with a smooth, yet passionate, style. And the riddims, oh the riddims. They are rough and touch and sounds like they’re directly lifted from a Channel One album recorded in the late 70s, when roots reggae started to give way for early dancehall. The set is magnificent from start to finish, but stand-out cuts include the groovy Rising Light, the militant Some More (Politricks), the dread Tell it to the Children and the galloping Fire. You have to be impressed by Spanish producer, mixing engineer and musician Roberto Sánchez. A few weeks ago he and Alpheus dropped a sweet and soulful rocksteady album. Now, he’s responsible for another set, but in a completely different vein. 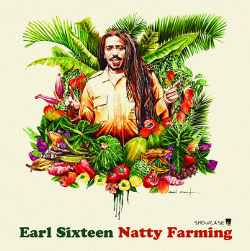 Earl 16’s Natty Farming is rub-a-dub old school style. Properly old school since the relentless drum patters are laid by Style Scott of Roots Radics fame and originally recorded at Channel One in Kingston. Just as several other notable album releases from Roberto Sánchez and his A-Lone Productions, Natty Farming is a showcase set with six vocals and their six dubs. Three songs are originals and three are cover versions. Natty Farming is organic and analogue. It’s warm and Earl 16’s pleading voice floats over the throbbing and syncopated riddims with elegance. I have yet to hear a below par album or tune from Roberto Sánchez and his crew.